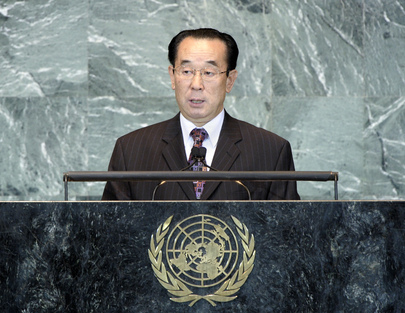 PAK KIL YON, Vice-Minister for Foreign Affairs of the Democratic People’s Republic of Korea, said that international law and order were being violated and undermined by the “arbitrary and high-handed acts of some [of the] big Powers”. He emphasized that such a reality required Member States to reaffirm the principles of defending peace and sovereign equality as enshrined in the Charter. Member States must also step up the process of Organizational reform, including strengthening the General Assembly. As an example of disregard for Assembly decisions, he said the 193-member body had long ago adopted resolutions on dismantling the “United Nations Command” in the Democratic People’s Republic of Korea, and on ending the United States blockade against Cuba, but they had been ignored. Enhancing the Assembly’s authority would require, among other things, urgently putting in place a mechanism which give that body approval over all Security Council resolutions related to peace and security, especially those enacting sanctions. Other forums where “the logic of power” was starkly apparent were the Third Committee (Social, Humanitarian and Cultural) and the Geneva-based Human Rights Council. Indeed, while Organizational reform had been touted as a way to eradicate politicization in the world body and its main organs, selectivity and double standards still prevailed when human rights issues were being discussed. Indeed, while some States were singled out, the actions of “major human rights violators are simply passed over in silence”, as per the political objectives and interests of the West, in line with Western ideals. With those issues in mind, he called for speedy reform of the Organization’s human rights bodies so that fundamental freedoms could be ensured for all people of all countries. As for the situation in the Democratic People’s Republic of Korea, he said Kim Jong Il was leading the efforts to build a powerful State, concentrating all the Government’s resources on bolstering the economy and improving the livelihoods of all citizens. Yet, the people of the Democratic People’s Republic of Korea could only press ahead with their efforts at building their country in a peaceful environment, and, regrettably, the Korean peninsula did not have a “lasting and stable peace mechanism”. Indeed, national division imposed by outside forces and a fragile armistice characterized by neither war nor peace had lingered for decades. Despite the broad desire to ensure stability, the build-up of arms was proceeding and “nuclear war exercises continue to be staged one after another against [his country] and in and around the Korean peninsula”. That situation often drove the peninsula to the brink of war, and the prevailing situation posed a grave threat to his country’s security and economic development efforts. Had it not been for the efforts of the Democratic People’s Republic of Korea’s great leader “and our powerful war deterrent”, the peninsula would have been turned into a theatre of war countless times, he said. The Government was consistent in its desire for stability and the denuclearization of the peninsula. The continued tensions there were the result of the hostile relations between the Democratic People’s Republic of Korea and the United States. As long as that hostility existed, the mistrust would not dissipate. To remedy that situation, his country had last year proposed to hold talks to replace the Armistice Agreement with a peace accord. Yet, the United States continued its “nuclear war policy” against his country. Indeed, the entire situation would never have become an issue if the United States had refrained from deploying nuclear weapons in the Korean peninsula. The United States, therefore, should abandon its hostile policy against the Democratic People’s Republic of Korea and move towards full-fledged dialogue. He said that while inter-Korean relations had been developing favourably since the 15 June Joint Declaration, they had now deteriorated to their worst state, creating an atmosphere of “war and confrontation”. That situation was being driven by fundamental differences between North and South. While previous authorities in the Republic of Korea had supported the Declaration, the current authorities “totally denied” it and had come up with their own “unification through absorption” policy, which presupposed one party’s collapse. He declared that that policy was the “road to war”, whereas a federal formula - based on coexistence and the best possible method for reunification - led to peace. If the current Republic of Korea authorities wanted to ease the current situation, they would abandon the confrontational attitude and make efforts to implement the Joint Declaration.